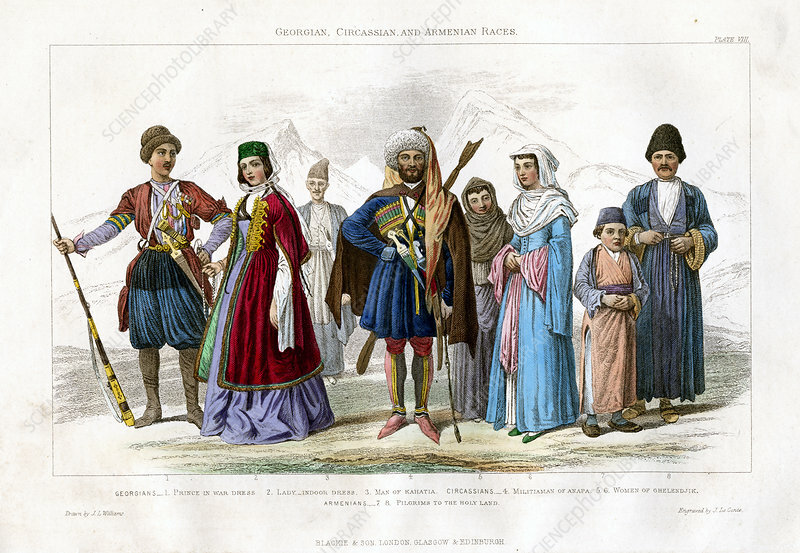 Georgian, Circassian and Armenian Races', 1873. Georgians are a part of the Ibero-Caucasian peoples and are classified in the South Caucasian family both linguistically and culturally. The Armenians are a nation and an ethnic group originating in the Caucasus. Georgians: Prince in War Dress; Lady, Indoor Dress; Man of Kahatia. Circassians: Militiaman of Anapa, Women of Ghelendjik. Armenians: Pilgrims to the Holy Land. Artist: J Le Conte.